1. This lavatory sink drain is constructed from heavy, genuine brass, and is exceptional quality. 2. It's a push-button style drain; simply press the top of the pop-up to close, and another press to open. 3. 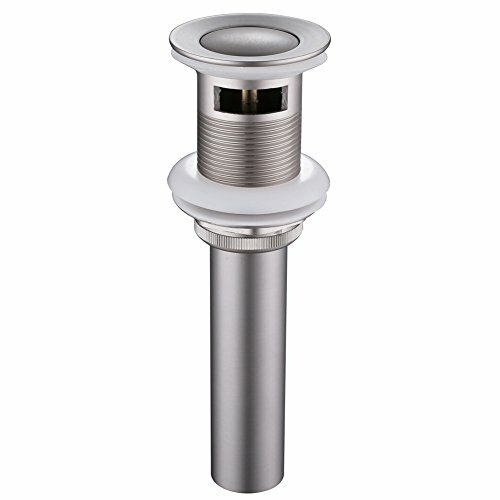 This drain is "Overflow Style" for use with standard sinks and vanities that have an overflow hole at the top of the sink bowl. 4. Standardized drain fit bathroom, vessel and wet bar sinks, or any sink with a drain hole from 1-5/8" to 2" in diameter (fits almost all sinks). 5. The drain exit, or waste pipe, is standard 1-1/4" size, although these drains can also be used with 1-1/2" traps and a bushing. Diameter of Bottom Pipe: 1-1/4"
Drain Hole Fitting:1-5/8" drain hole (minimum diameter required), fits drain hole from 1-5/8" to 2" in dia. More size information please refer to the second picture shown on this page. Upgraded Version: there is a gasket inside the connection (where the bottom pipe screw into the top drain) to prevent leaking. Tips: We recommend using plumber putty around the top flange when installating for a better tight seal. 1. This product is designed to be used on sink with overflow hole (meaning that there is a hole at the top of the sink). 2. Please kindly check that whether your sink has an overflow and check the product dimension before buying. EASIER POP-UP DESIGN: functional pop-up sink drain with overflow, great replacement for the standard pull up rod or the plastic one. USER FRIENDLY OPERATION: the push-button function features to fill and release the water in an easy way, also adds a classy appearance. WELL CONSTRUCTED: solid brass top drain consturction with rustproof stainless steel bottom pipe, durable enough for long term use. EASY TO CLEAN & ASSEMBLE: simply unscrew the drain stopper for cleaning, including all parts for assembly, gaskets for a tight seal. If you have any questions about this product by Angle Simple, contact us by completing and submitting the form below. If you are looking for a specif part number, please include it with your message.